Use your Engaged Library Card to receive $250 off your rental fee. The Glass House can accommodate 120-150 guests. A finalist for House of the Year in 2017 by Architectural Digest magazine, guests can stay overnight at the House and use the 2 large outdoor areas for events (the house sleeps 18 guests). The main outdoor grass area can handle 125 -150 guests and a large covered porch and portico can be used with a tent in the event of rain. The venue has luxurious Bride and Groom suites and comes fully furnished with a full kitchen, 5 bathrooms, and several large outdoor areas overlooking the lake. 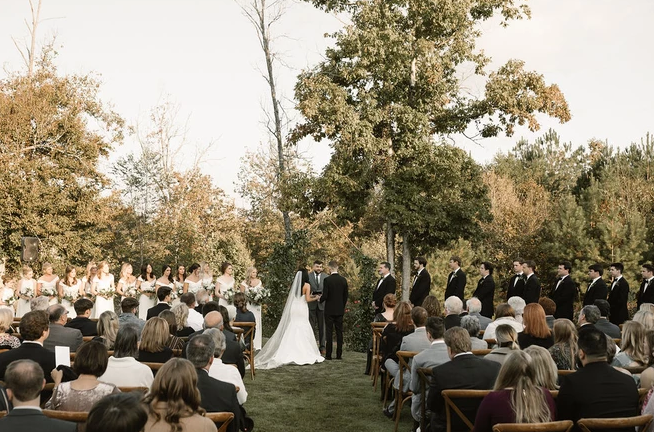 The Barn can accommodate 250-300 guests: Perfect for larger groups with indoor and outdoor ceremony options overlooking beautiful Smith Lake, The Barn is surrounded by gorgeous trees and woods and offers unbelievable water views. The indoor venue can seat 225, and the outdoor area can seat 250+. The venue has Bride and Groom suites and parking for 125+ cars. The barn is less than an hour from downtown Birmingham and the property has overnight accommodation options for 30+ people! What's unique about this location is that it offers 40 acres of private woodlands, and 1,400 feet of unobstructed waterfront views on gorgeous Smith Lake. The venue offers gorgeous lake views on all sides, along with a modern house and barn, both of which are available for weddings and other events.